Apache is the old established and rare Reggae club. 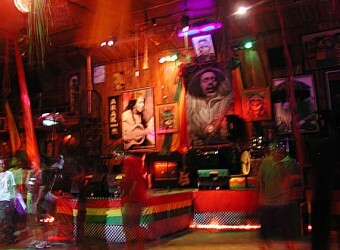 In the club, you can enjoy slow Reggae atmosphere of LOVE & PEACE. Stay there on rhythm and cozy time. It is recommended for Reggae lovers! It was the first time for me to go, and I fell in love with reggae music. I know only Sean Paul LOL. I listened to reggae music here and on the way back home I bought CD. It was great to have cocktails while listening to the music.